D-Pad Studio’s long-awaited labour of love is almost here and looking good. D-Pad Studio has been working on Owlboy for nine years. Which means the Norwegian outfit began developing its flagship game in the same year the world was introduced to the likes of Portal, BioShock, and The Witcher. It pre-dates both Barack Obama’s presidential premiership and, for want of less banal term, the subsequent ‘indie renaissance’ which has swept PC gaming in the interim. That last part is important because the surplus of retro-styled, pixel-paraders that have since flooded the landscape of independent videogames has left the market feeling a tad saturated. Nowadays, you’d be forgiven for overlooking a game like Owlboy—a familiar-looking platformer that has been on the cusp of release for the past five years—but you shouldn’t. Why? Because it’s fantastic. That is, the 90 minute-long beta which is being exhibited at this weekend’s PAX West is fantastic—a preliminary chapter of sorts that explores the game’s first dungeon while introducing its mechanics and characters along the way. From start to finish, its vibrant palette is bursting with life, as are its whimsical townsfolk and its inspiring soundtrack. Zipping around Vellie—the half boy/half owl protagonist Otus’ hometown—is also an absolute joy. Flying is Owlboy’s central mechanic, you see, and tapping A sends Otus skyward, where you’re then free to soar around each level without limits. Not being shackled by timers or stamina bars or the likes is incredibly refreshing and, without sounding overly profound, liberating. We’ve become so accustomed to restrictions on flight via videogames that taking to the skies in Owlboy was something I never tired of during my playthrough. So long as there’s room above your head, you’re free to go soaring, which is in itself an interesting take on the genre—you’re ultimately left doing little platforming as whizzing to and from your destinations is not only more fun, but also more direct. The only time you’re required to land is to engage certain characters in cordial conversation or to progress the plot, while health and powerups can be unearthed by grabbing them from the landscape. Where Otus is skilled in the skies, he isn’t very confident in confrontation. Instead, he relies on companions known as “gunners” and “helpers” who provide different services—a role assumed by best mate Geddy in the opening level. A la Sonic and Tails, Otus elevates his chum from the deck and the pair set off into a nearby cave to track down a shady pirate adversary. Once inside, they’re met with a series of pressure point contraptions and lever switch obstacles which are straightforward enough, but, again, stand to introduce you to the workings of the game. Otus himself is also a mute—not simply a silent protagonist—which prompts Geddy and those around him to do all of the talking. From what I’ve played, the friend-in-need premise works well and ensures a degree of fluency in joining each slice of narrative to the next, however how the game keeps things fresh without simply reverting to generic Metroidvania mechanics remains to be seen. Geddy’s co-operative pistol shooting is tight and responsive, and works well in concert with Otus’ flight ability, and Spelunky-style teleportation is introduced towards the end of the demo segment. This is in turn makes for some interesting puzzle solving—fingers crossed similar levels of ingenuity await different set pieces in the final game. 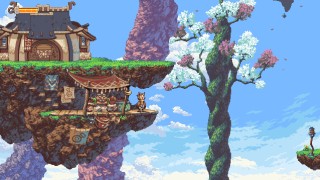 Again, it’d be easy to disregard Owlboy against the number of similar-looking indie games that’ve come before it, but there’s something that feels truly exciting and special about this one in particular. Instead of portraying a throwback to the games of yesteryear, Owlboy feels like a reimagining of one which already exists and I’m genuinely excited to see what it serves up in the coming months. It's beautiful and great fun and I’m left wondering how it might’ve fared had D-Pad managed to get it out the door in a more timely manner. So what has taken it so long? D-Pad plans to finalise a launch date over the next few days, however has Owlboy really needed the best part of a decade’s worth of development time? “When we first released the demo for Owlboy, which was way back in 2011, we got so much feedback that we decided to redesign the whole thing,” says Madsen. “We’ve done so many redesigns of the game and we did think in 2011 we were soon done. In that first trailer it actually says that it’s coming out in 2011. That obviously hasn’t been that case. D-Pad plans to reveal Owlboy’s final release date at this weekend’s PAX West. It’s also playable there if you’re able to make it along—I hope you do if you are.